C&S Ez Fill Suet Basket Wild Bird Feeder is a green colored wire basket specially designed to make filling bird feed a snap. The vinyl coating ensures that little bird feet won’t freeze in winter or roast in summer while feeding. It’s a lovely plastic coated wire basket with chain hanger that will enhance your garden. Holds one large Snak or up to 56 oz of suet. Suet is animal fat. It is the most concentrated source of energy you can offer wild birds. C&S Suet is made with only the highest quality processed beef kidney fat while special processes remove impurities that can cause low melting points and spoilage problems. C&S Treats are a poured product and will become soft and pliable at around 100 degrees (F). C&S Delights are refined even further and pressed to produce a “No Melt” suet that can be fed during the hottest temperatures. C&S Suet is reasonably priced and eliminates the mess of home production. Suet is one of the top three foods to feed wild birds. Birds have high metabolic rates, so it is not unusual for birds to consume 1/4 to 1/3 their body weight worth of food a day! Offering suet, mixed with the highest quality grains, nuts, fruits, and flavored pellets provides a high caloric energy source. C&S Suet is one of the first foods birds will offer their young. How do I feed suet? Wild Bird Suet is traditionally fed in vinyl-coated wire cages. They are inexpensive and durable. Wire dimensions vary depending on how starling or squirrel resistant you want your feeder to be. 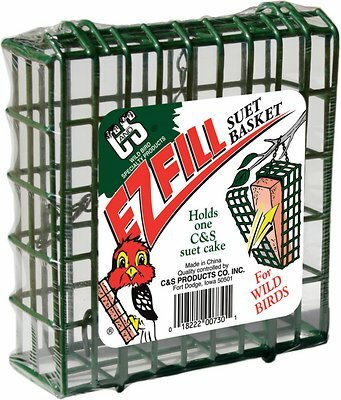 The cages, or baskets, hold from one to several C&S Suet Cakes or Bricks. The cages may be hung from branches, tree trunks, or hooks. There are also several designs available combining wire with wood or plastic. When do I feed suet? Basket is sturdy and well-made. The green color blends well with all the trees in our backyard. Sometimes I will put two suet blocks in the feeder. I have to squeeze them together to fit but it works for the birds so I'm good with it. I bought these for my chickens and it does the job well. The bar spacings are pretty small but of course it wasnt meant for chickens so its ok. Would definitely recommend it for feeding wild birds and such! Easy to open/close and i just love it! These are nice and large and hold all the different types of suet that I've used. Chewy.com is an excellent choice for your pet products. Good prices, very fast ship. My cat loves it -- and so do the wild birds! I've had many different types of these feeders. This is truly easy fill compared to others. Your suet doesn't get mushed pushing it in. It lays in the large opening and the clips are very secure when you close it. I'll see over time how the coating hold up. But it looks good. It works and they love it. Took a while for them to find it, guess its location, location, location. So easy to use with the Deloit suet cakes. Birds go absolutely insane for them. Do have one issue. The squirrels try to use it too!!!!! !